The most linear stage for large voltage swings is the grounded base or common base amplifier. Unfortunately interfacing his stage with others is not easy because of biasing problems. Lender (ref2) presents the most elegant solution to this problem. I have come across. His circuit has a differential input stage and a current mirror transfers the bal. output back to the single-ended output. "Power Amplifier with darlingon output stage"
This article I want to have. No PDF file about this I find online (on the web). Who knows, where I can download this original article from Motorola ? This voltage gain stage topology you can find in several designs, e. g.
there are 18 other "Lender" results in the search function. Have you asked Erno? He may have a copy and/or willing to scan. This is indeed an approach with potential. 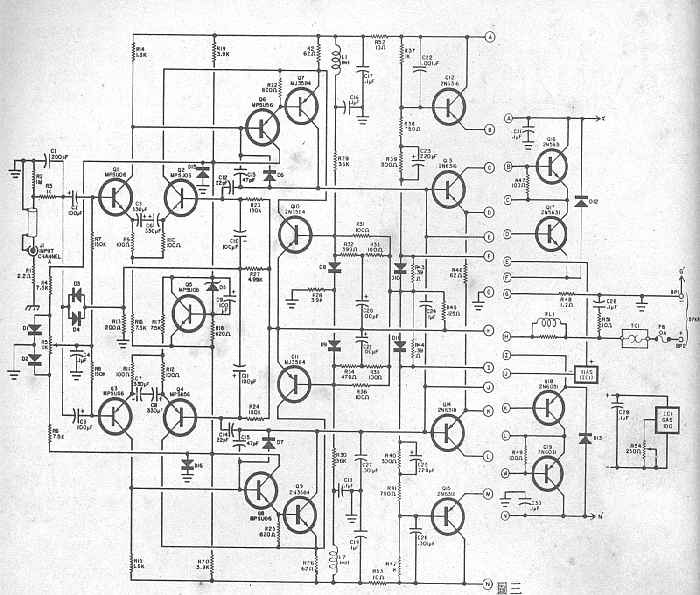 I also came across the tube.cad article [http://www.diyaudio.com/forums/showt...44#post1847644] but I found it does suffer from producing imbalance in the LTP when not used as part of a symmetrical design such as Roender's folded cascode. You end up using a lot more parts than the simple Self single ended VAS. Pavel (PMA) is using it, too, in the DisPre II. Albeit unbuffered and complementary. This looks a little different than common base, more like a differential with input into the base and into the emitter ? warning: number 2 wandered off-topic quite a bit, as is usual around here. Thank you very much for the additional circuit advices with Lender's topology. Motorola Inc., Geneva, Switzerland, 7.9.1974. Erno says. which this article is mainly concerned the application instructions of newly introduced darlingon technology. Lender's circuit was there one of some more topics. This article only the old, former Motorola employees can look out. Since then the field of power devices transits in the company "ON SEMI", it can also be that this article now by ON-SEMI is archived. This article was only available for large customers and otherwise in those days for internal use only. in any one days by this forum come up this article - so I hope. The most linear stage for large voltage swings is the grounded base or common base amplifier. Lender (ref2) presents the most elegant solution to this problem. I have come across. It`s a mildly flattering solution resulting in something else. for large voltage swings and great linearity, you might want to try Hawksfords VAS stage. I hav e not built it, but in sims its about 20 times better than a standard cascode on distortion.